Furniture pick-ups within our service area are free of charge. The age of the furniture does not matter however we only accept furniture in very good to like new condition, no stains, tears, cat scratches or damage. Dates and times are negotiated with the EChO’s furniture department at 303-679-8280 or via email at furniture@evergreenchristianoutreach.org . EChO has a 16’ truck and we will ask if a location has difficult access conditions such as mud, snow or a cramped driveway. Please advise us of this so we can arrange to bring a smaller pick-up truck. We ask that your furniture be ready to pick up in your garage or somewhere that has access. Contact EChO’s Furniture department with questions or to make a pick-up appointment at 303-679-8280 or by email at furniture@evergreenchristianoutreach.org . 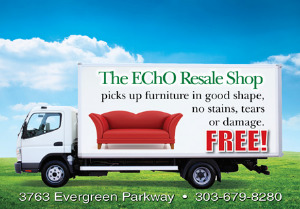 Thank you for donating your furniture to EChO Home Furnishing and Resale Store. Proceeds from all sales benefit the programs of Evergreen Christian Outreach (EChO).